LG's new G6+ smartphone includes Quad DAC and B&O headphones | What Hi-Fi? 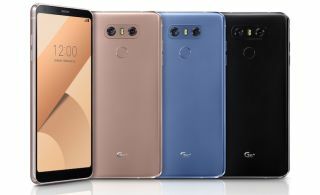 Combining the features of the different G6 smartphones that hit the Asian and American markets, the G6+ also comes with a face-unlock feature and a low power mode - which will be available to current LG G6s via a software update. The LG G6 only came out a couple of months ago, but LG has already released a new version. Called the LG G6+, it's basically the same phone with a few key modifications: it now starts with 128GB of storage and has a couple of new colours - optical marine blue, optical terra gold - but, most importantly, it has the 32-bit Quad DAC that was previously only found in Asian versions of the phone. To enjoy that Quad DAC, the new phone also comes with some B&O Play headphones - although LG doesn't specify which model. Since the audio quality of the standard G6 was disappointing, we hope this new iteration will remedy the original's lacklustre sound. LG has also added wireless charging, which was not on the Quad DAC version available in Asia but was on the US version. A few other software features are scheduled for a later update of the phone. These include 'Face Print', which lets you unlock your phone simply by holding it up to your face, a low-power mode and a 'covered lens' warning when you inadvertently put your fingers over the camera. While we don't know exactly when (or where) the G6+ will hit the market - sometime in July is the best we can say for now - we're hopeful it'll be coming to the UK's shores.